Returning to the role that launched Cate Blanchett and garnered her an Academy Award nomination for the first Elizabeth, Blanchett turns in another Oscar nominated performance as Queen Elizabeth I in director Shekhar Kapur’s follow-up Elizabeth: The Golden Age. In doing so, Blanchett became the first actress in history to receive two nominations for playing the same character and while Kapur’s sequel isn’t quite as emotionally satisfying or powerful as the 1998 Elizabeth, it’s well-worth the investment for viewers who enjoyed that film, Blanchett’s roles or just history in general. In The Golden Age we catch up with Elizabeth now in her fifties (although Blanchett herself looks much, much younger) and like Roger Ebert wrote as “her kingdom [is] threatened by two Catholics” in the form of Mary Stuart or Mary, Queen of Scots (Samantha Morton) and Spain’s King Phillip II (Jordi Molla). Busily working on the Armada which he hopes will invade England, the King and others sympathetic with Spain feel threatened and angry by the arrival of dashing Sir Walter Raleigh (the dreamy Clive Owen) who has just named Virginia for the Virgin Queen and returns to England from the new world with additional tokens of his affection in the form of tobacco and potatoes. Always loyal, Geoffrey Rush returns as Sir Francis Walsingham but now in failing health as he nears death, Rush never gets the chance to command a scene as he did with his previous turn years earlier. 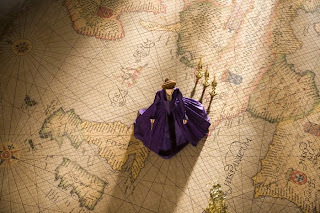 Instead, we become invested with the “feminist monarch” (IMDb) who uses her favorite lady in waiting Elizabeth “Bess” Throckmorton (Abbie Cornish) as the go-between for herself and Raleigh, blinded by the fact that perhaps Raleigh and Bess are better suited to one another, which culminates in some rather excruciatingly emotional scenes where Elizabeth ends up begging and acting out when her own heart is broken. While it’s hard to imagine such a powerful figure resorting to childish behavior, the film’s real beauty lies in the lush, sensuous detail of every scene with not only the breathtaking cinematography but also the painstaking attention to detail in the art, costume and other design aspects and there are times when I felt my breath catch at its undeniable beauty that is made even more spectacular near the end when Raleigh boards his ship and fights against the Armada. Even though it’s Blanchett’s show all the way, up and coming star Abbie Cornish (Candy, Stop-Loss), Owen, as well as an underused Samantha Morton help keep things rolling along.